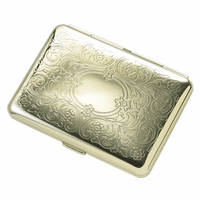 FEATURES/SPECS A gift truly fit for royalty, this Fleur de Lis pattern engravable cigarette case features the classic floral pattern framing a smooth round engraving area. Inside, it holds up to nine king size cigarettes in place using lightweight metal arms. 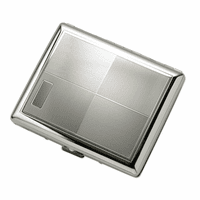 A push button opening lets you access your cigarattes with ease. This engraved cigarette case comes packaged in a gift box and ships out the next business day. Are there tiny springs that gently pop the top open when you press the button? Yes, you just press the button down to release the lid. When I'm personalizing it, how do I know what font to use so that the words will fit? You'll just need to press the Preview Personalization area below where you enter your engraving text. What does it mean elastic bands? Can I see the interior? We don't have a picture of the interior, sorry, but they are just bands that stretch across the cigarette case, holding your cigarettes in place. I use this as a credit card case, I love it! This product is really nice. I bought it for my girlfriend to replace her old one. It looks almost identical and it's of the same quality. The engraving came out really well too. Needless to say, she loved it. Feel excited to give this to my loved one. Very nice. This is for my father in law and he is going to love it. AND it came very fast. I am impressed.